I am very happy to report that my fish leather experiments are moving along nicely. This week I’m combining my curiosity for this new embroidery medium with my baroque pearls. The new blue strand that I picked up recently only has a handful of wonky beads. Most of them are drilled quite smoothly, but I did find a few that had exposed holes that make them unsuitable for stringing. I was hoping that they’d make good accents for embroidery, so I’m testing out two nice looking pearls in the same piece. We finally completed our latest medallion pendant. A new color was finally added at the very end, and the dark topaz trim goes perfectly with the golden patina of the scarab. Themes and palettes are all well and good, but sometimes it’s fun to just throw out all the rules. As I’m preparing all of the details for my submission to this year’s Ugly Necklace Contest, I’ve been craving some more eclectic and freeform designs. And now that heavy coat weather is over, it’s also a good time to experiment with layered outfits and wild styles. With this idea in mind, I went in search for some interesting, exciting, and eye catching pieces to pair with a great statement necklace. I started with a chunky multi-strand bead and chain necklace. With a great mix of neutrals, it would be that much more fun to play with patterns and textures. For each outfit I combined pieces that had prints or patterns, with a few complementary colors to bring out the personality in the necklace. I also added lots of chunky bracelets, a few with some great examples of trade beads at work. This Trail of Turquoise necklace project from FusionBeads.com is the perfect combination of chain and chunky beads. 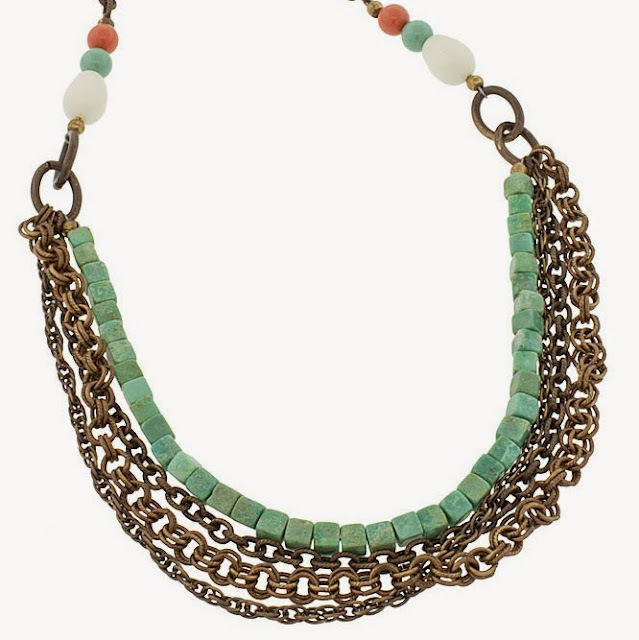 The soft colors work harmoniously with the metals - for extra fun, try adding some striped beads! If you're not comfortable with freeform but want the look, start with a simple technique and add lots of bead varieties. The Vegan Wrap Bracelet from Beadaholique.com provides a great place to start. Layering bracelets is a great way to add personality to any outfit. The simple seed bead Stratum Bracelet tutorial from AuntiesBeads.com projects lots of color in a totally stackable size. Natural elements in jewelry look great when they're big and bold. The combination of links, leather, and big beads in Live In Art's Chunky Bracelet Tutorial really delivers. What’s your favorite freeform technique? Beaders, something really exciting is happening, and has been for several months now. A whole new generation of beaders and jewelry makers is being formed, and the best part is, a lot of them are boys. If you don’t know any kids or people with kids between the ages of 6 and 12, it’s possible that you’ve never heard of the Rainbow Loom. This past holiday season, it was the toy to have, and stores were selling out everywhere. What makes this crafting set different from other toy trends is that it is a favorite of boys and girls of varying ages, rather than just a specific little childhood niche. Everyone loves Rainbow Loom. Although I’m not a big fan of plasticy things, and we have no need of one in our house, I’m an admirer of the Rainbow Loom, too. 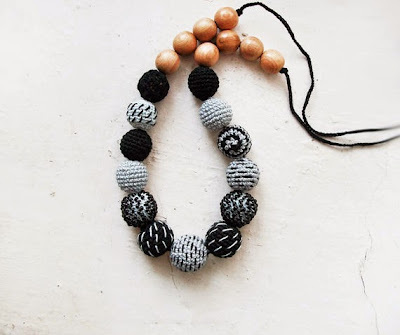 I love it because, like macramé friendship bracelets and boondoggle key chains, this craft trend is going to usher in a new batch of future beaders - and this one might be bigger than any before. 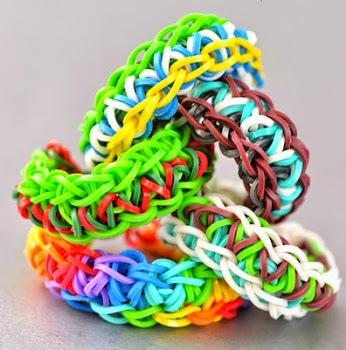 If even a small fraction of kids weaving tiny rubber bands into bracelets develops a love of beadwork, that’s still a lot of new designers to share inspirations with in the years to come! 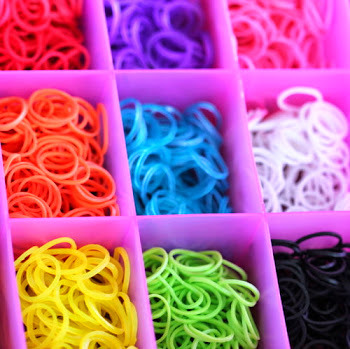 We sell Rainbow Looms and accessories at my day job, and whenever a small gang of preteen boys drops by to casually pick up some new bands without the slightest hint of self-consciousness, I smile - a lot. At no point was there ever an announcement or decree stating that it was “okay” for boys to do this colorful, wearable craft. It just happened, proving in a small way that gender roles are a lot of rubbish. 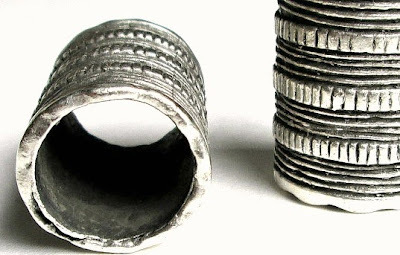 So, to all of the boys and girls out there who are learning to love jewelry design, welcome! Pull up some beads and lets make beautiful things. Gems, jewels, beads and baubles – we beaders can never have enough of these little morsels! Whether you love the natural look of gemstones and pearls, or the uniform elegance of glass and chain, you’ll find it at House of Gems. This shop has a great selection of beading essentials and favorites, and they’re offering Inspirational Beading readers a chance to sample the goods! For a chance to win a $25 gift certificate, head on over to House of Gems and check out their selection. Then leave a comment here on Inspirational Beading, letting us know which bead or product is your favorite. Anything goes! One lucky winner will be drawn on Thursday, May 1st. Important: Please make sure to leave your comment on this post, and include a contact method with your comment if you do not have a Google profile with email enabled. For security email address can be typed like so: username at yourmail dot com. Incomplete or duplicate entries will not be included in the draw. This giveaway is open to international readers. Good luck! A big thank you to House of Gems for sharing this giveaway. To see more beads, inspiration and project ideas from House of Gems, check out their weekly community feature #BeadingFriday on Facebook, Twitter and Google+. The bead tray is looking a little chaotic right now as I try to wrangle several projects and get caught up on missed work. All the beading I've accomplished since last week was done within the last 24 hours or so, and there’s a lot of wasted hours in between. Several days ago I was feeling a little under the weather, so I dusted off a favorite video game to veg with and it was so much fun that I didn't want to do much else. The same often happens when I get wrapped up in a good book, too. Although it’s pretty unproductive at the time, when I’m finally ready to get back to work, I’m bursting with ideas and eager to get going, so it does provide a nice creative boost in the end. Right now I've got a couple of different embroidery experiments on the go, including some pieces using tilapia fish leather. It is really cool stuff; I’ll share more on its merits when I’m finished, but for now I can say that it really satisfies my craving for the natural patterns that I miss out on by not using gemstones. Last week’s medallion is almost finished. Apparently for this one we’re going to be repeating transparent cherry and Montana sapphire throughout. So far, I like it! My summer collar idea is still on the drawing board until I get these more exciting experiments out of the way. Although I love all four seasons just as much as anyone, as far as I’m concerned the months of the year are best divided into two categories: those when you can wear shorts, and the rest. So now that Easter is behind us, I’m ready to put away the pretty pastels and bring on the heat! For this month’s mood board, I’ve refined the look a bit, and reserved the bead picks for their own mosaic. I started with a sort of Cinco de Mayo theme in mind, and searched for exciting statement pieces, hot colors, and a hint of natural goodness. With so many multicolor and mixed media jewelry pieces to showcase, I chose a simple but still interesting dress for a background. The huge daisy print is definitely a great show-stopping complement to the full-texture jewelry. What kinds of beads are you in the mood for this month? 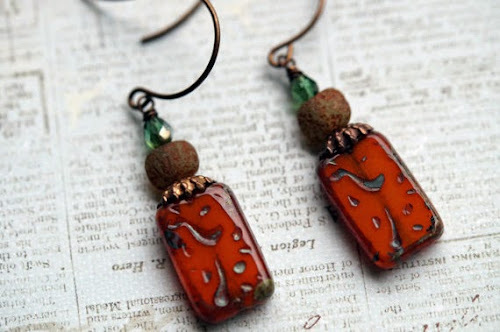 They’re gorgeous, affordable, and versatile - nobody does beads quite like Czech glass artisans. Today my guest is Andrea from Bead Soup Jewelry, who shares her love of these perfect and inspiring beads. Andrea: This might be cheating but my all time favorite bead would be anything Czech glass. There are so many shapes, sizes, and designs. You can really pull off any design with glass beads. I think that Czech glass has come so far since I first started making jewelry. The Picasso finished beads are to die for! 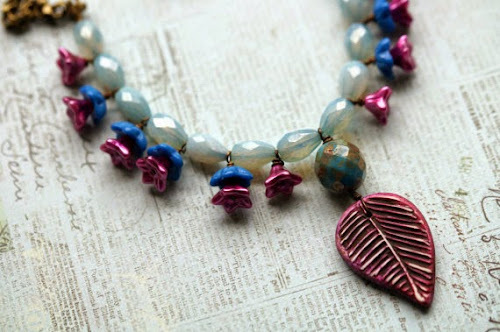 Andrea: I really like using the Czech glass beads to make knotted projects like necklaces and wrap bracelets. With a few strands of fire polished or druk beads you can make a really eye pleasing and affordable piece. Inspirational Beading: Of all the creations you've made with these beads, which one is your favorite? Andrea: One of my favorite pieces of jewelry made using the knotting technique would have to be this Woodland Knotted Necklace, I used a polymer clay focal piece that I made and a brass patina leaf charm. 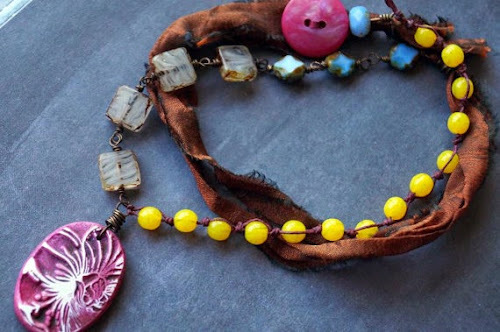 I use some vintage Lucite beads and wood beads to give this necklace more detail. 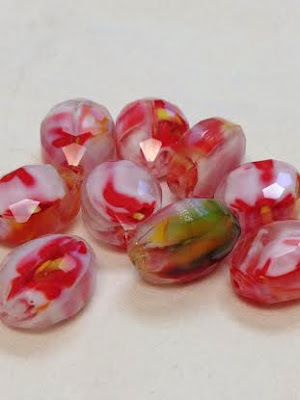 Andrea: To make the most out of your beads or to use them sparingly, I would break up a design by not using just Czech glass but put other beads in too. That will also give your jewelry character. 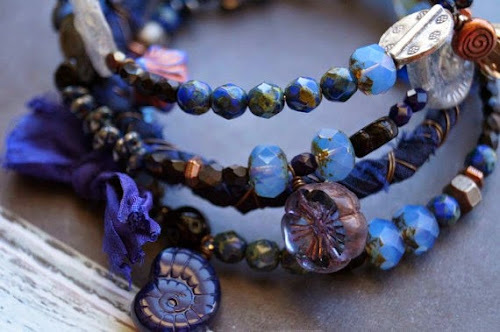 Andrea: I guess my signature pairing for Czech glass beads is sari silk, I use the silk in many cases for the back of a necklace or just simply in a bracelet. Inspirational Beading: If you were stranded on the moon, and you could have only one kind of bead with you, would you choose these? Why or why not? Andrea: I love this question, yes I think I would take some Czech glass beads if I was to do some beading on the moon.. I would take these because I am so familiar with them. Andrea: I really don't have a special way to store my beads, they are just in little baggies in big plastic tubs, I love plastic containers, use them for everything. I guess its my way for looking organizer but not bring organized. 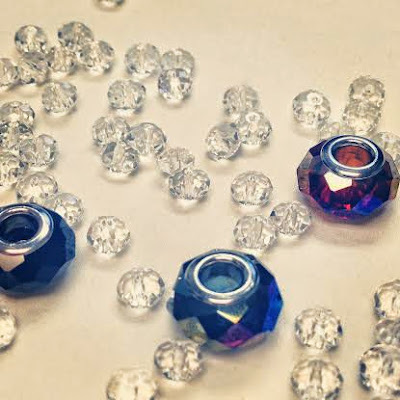 Inspiraitonal Beading:In your opinion, what is the best source for Czech glass? Andrea: I really don't have a brand, Czech glass beads come from a hand full of manufacturers, and I really just buy them on etsy, and local. Czech glass beads are pretty common and everybody sells them. You can see more lovely Czech glass jewelry designs at Bead Soup Jewelry on Etsy and on Facebook. 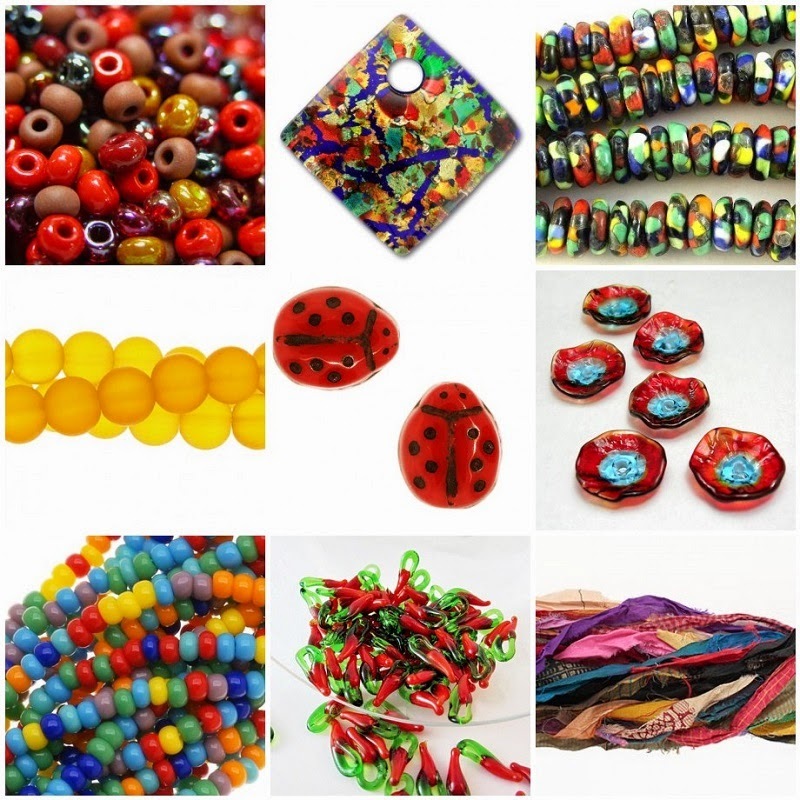 Also check out Andrea’s blog to see new designs, and the latest additions to her supplies shop Bead Soup Beads, where you can find an amazing selection of Czech glass and handmade polymer clay beads and pendants. This week I’m feeling a little slow and distracted in my workspace, and I’ve taken a couple of days to rest my creative muscles. Sometimes it’s good to just step away for awhile, and when it’s time to work again, there’s that much more enthusiasm. I’m still just getting started on the new medallion pendant, but I’m loving the colors so far. Before I get any further, I’ll have to clean up that bead spill! I’ve recently switched to Nymo for embroidery, and although the technique doesn’t really call for conditioning, I find that the extra stretch involved in waxing the thread really helps. Plus the beeswax smells divine. I’m also testing out colors for a new collar idea. It’s a spring/summer palette with yellow, pink and chartreuse, inspired by 1960’s patterns. We’ll see how it goes! It’s time to reveal the secret behind my new line of bead embroidered pendants! So far this ongoing project has been one of my absolute favorites, and I hope to continue it for as long as I can. It all depends on my new beading partner. 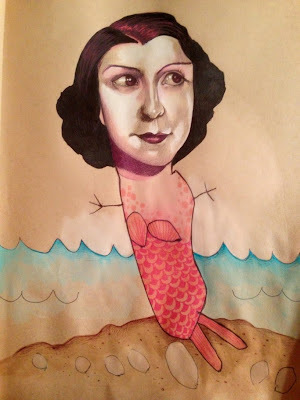 Several weeks ago, I was reading an article about a mother-daughter art team that creates the most unusual and exciting sketches. First Mica Angela Hendricks takes some portrait inspiration from vintage photos. Then she lets her daughter fill in the rest of the picture with her limitless imagination. Mom adds a bit of color and an amazing work of art is born. I loved the prints, but it was the collaboration that really caught my attention. I immediately wanted a piece of that creativity for myself. I turned the idea over and over, hoping to come up with an teamwork method that I could use with my own designs. Then I had it! Embroidered medallions are quick to make, and offer a design process that would allow me to involve my favorite munchkin without expecting him to work a needle. He was really excited at first, and it only took a few seconds for him to make his first selections. We start with the focal bead, which he chooses from 3 or 4 options that I provide, rotating through my collection of coins and cabochons. Then he picks a felt color and the first round of seed beads. One by one he selects all of the following rows, and I keep on adding color until he tells me it’s done. Not only has the project been a great way for us to do something together, but we’re both learning a lot. At his age, the names of colors are particularly interesting, and it’s fun to watch him catalogue them for future reference, then bring them out again when it’s time to choose the next round. Robin’s egg is a favorite right now. For me, it’s been another experience in letting go, just like with the Ugly Necklace series. There have been a few times when I thought his color choices crazy, until they absolutely worked. I've learned to be a lot more trusting, and it’s awesome to be able to say to him “You made this, and it’s perfect!”. When choosing from the millions of combinations of materials, we don’t often think of the many interesting ways in which jewelry can be used. Not just for looking pretty, jewelry can be so much more. 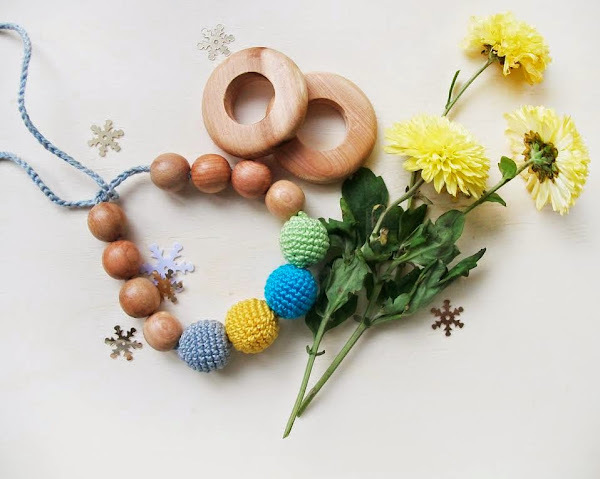 Today’s guest is crochet artist Olesya of Little Sweet Candy Shop, who combines fiber and beads to make lovely necklaces and accessories for moms - and everyone else! Inspirational Beading: When did you first get started with crochet? 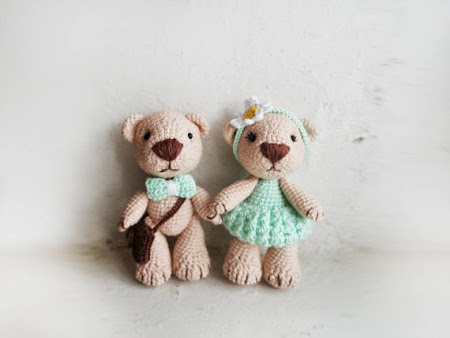 Olesya: For me, crochet has always been a hobby, I learned this as a child from my mom, she was mistress of all trades. Inspirational Beading: Have you always been interested in jewelry design? How did you get started? Olesya: Seriously started doing it 6 years ago when a friend offered me a job as a designer and creator of children's toys and beads for moms. This work completely intrigued me, all the time I spent creating new designs, products. Then come up with a whole series of jewelry for women and girls. My best friend Tanya helped me to create a site with which I have accomplished warriors first sale not only in Ukraine, but also in America, Germany, Denmark. Now my card sales is very extensive, I have made many friends around the world and I'm happy. Half a year ago I discovered Etsy. My shop is rather new, but there are already a lot of fans, friends and associates. Olesya: Like everyone else, probably my first items I gave generously to friends and family. This is my first fans and support group. 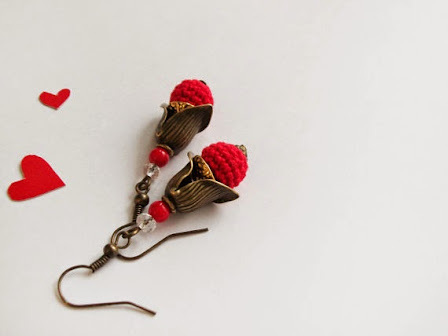 The first were crocheted earrings - grapefruits. Many years have passed and they are still stored at my sister. Olesya: Inspiration for me has always been music (classical, rock, Celtic, ethnic, pop), nature, the work of talented artists - regardless of the type of art. . And the last 4 years the inspiration - this is my family and my daughter. Olesya: I like the whole process of all its components from the beginning to the end. But most interesting to me is sketching, selection of materials, tools (this can be engaged around the clock). Wherever I went - always with me a notebook for sketches because ideas can visit me anytime and anywhere. Olesya: Basically I create jewelry accessories, toys for kids that creativity I choose bright different colors, I try to embrace the whole palette, be varied. Children need to be surrounded by happiness, light and love. For the women's collection I choose pastel colors and contrast - turquoise, yellow, green, gray. It depends on my mood, sometimes the wishes of customers. Olesya: By virtue of my hobbies, I like a lot of things. This wood, especially juniper (it is so fragrant), natural fabrics, yarn (soft cotton comfort for the body), as well as natural stones, which are also used for jewelry. Inspirational Beading: What is the most exciting design in your shop right now? 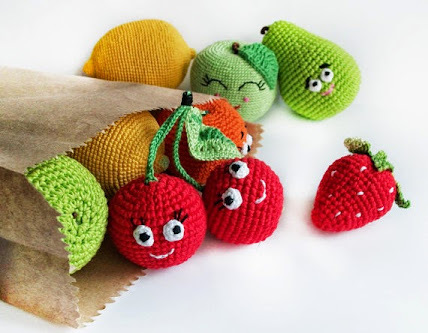 Olesya: I think that is a collection of "funny fruit" - they are all crocheted soft toys with funny faces, which are very popular with children and adults. This collection I thought of 5 years ago. Olesya: In general, I am very happy if I can inspire someone to do creative work. I want to add a little beauty to the world, to create small toys and jewelry that will delight people, toys that help kids develop, surround them with care, will be safe and useful for them. You can see more unique jewelry and crochet designs at Little Sweet Candy Shop on Etsy. For the latest designs and inspirations, follow along on Facebook, or on Olesya’s blog. Right now there are some really exciting things happening on my bead tray: I’m about to open several hanks and strands of new beads. It’s one of those great moments in beading, where everything is just right. 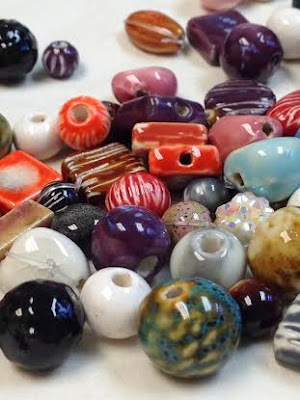 The palette is selected, the pattern sketched out, and - best of all - fresh, untouched beads are ready to go to work. There are two projects just about to begin. The first is a new top secret bracelet with some natural and ancient inspiration. The second is medallion number five, featuring a brand new scarab color. These amazing little Czech beads are surprisingly hard to come by, so it’s always nice when a strand pops up in a favorite shop. Last week’s collar is finally finished. The colors didn't have the tribal effect that I was looking for, but they do have an amazing summer feel that draws you right in. Now that the Egyptian Gods challenge is over, I’m looking forward to more simple experiments with color in collars, just to see what happens. 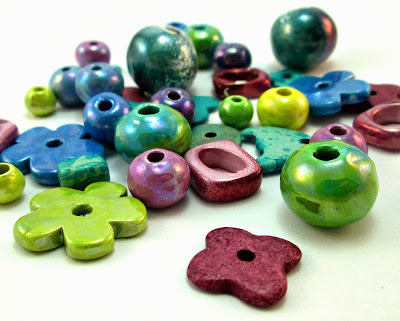 Although there’s really no such thing as too many beads, it can be a bit tricky finding inspiration when there are so many wonderful baubles waiting to be stitched. I’ve really beefed up my bead stash recently, and now I just don’t know where to begin! Spring and summer inspirations are definitely having some influence, which is why these three bead picks are at the top of my list right now. I’ve been keeping my eyes peeled lately for great buttons, particularly those that are metal free. This usually leaves rather expensive crystal, glass, and ceramic buttons, so when I saw these totally affordable beauties at Artbeads.com, I couldn’t resist. These hand painted flower buttons are made from coconut, so they’re really lightweight despite their size - 35 mm of flowery goodness. The only thing better than a lovely, organic baroque pearl is a blue one! Although these beads aren’t always drilled ideally for bead weaving, I can’t get enough of the fun shapes. I'm planning to experiment a bit with any culled pieces and see if I can work them into bead embroidery in a satisfactory way. It's not good to waste such gorgeous beads, even if the holes are a mess. The dark blue color of these pearls from Fire Mountain Gems is definitely beach worthy, but I can see them just as easily in some Egyptian inspired pieces. And finally, in my quest to find great seed bead colors to substitute for gold, I recently fell in love with matte mustard yellow from FusionBeads.com. They’re a little bit yellow and a little bit brown, and the matte finish gives them a wonderful earthy look. Although I usually stay away from matte finish seed beads - I find them far too crunchy for beadwork - I can't pass up a good shade of non-metal gold. I can’t wait to try them out with cobalt and jet black! What beads are inspiring you right now? Cabochons, fringe, and oodles of lovely seed beads - is there anything more exciting than a perfectly stitched piece of bead embroidery? Experienced designers create and construct designs that are as stunning as they are intimidating to beginners, but the good news is the techniques are deceptively simple - no matter what the size of the project may be. 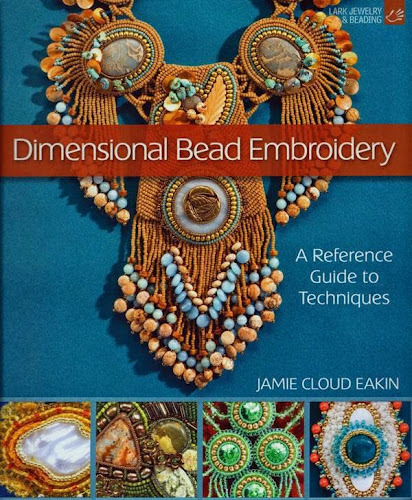 In Dimensional Bead Embroidery, Jamie Cloud Eakin lays out all of the basics for bead embroidery, guiding readers through the process with ease. Unlike many beading instruction books, this reference guide focuses mainly on the techniques and how to execute them, rather than on how-to’s for finished designs. Although there are 9 projects complete with instructions, it’s the chapters on materials, stitches, and design methods that make this book an invaluable tool for beaders. Jamie begins with an overview of all the beads, materials, and tools needed to create the pieces shown in the book, as well as new experiments in bead embroidery. Then it’s on to the teaching chapters. Starting with the simplest steps - such as knotting and adding thread, and selecting a backing and design - every aspect of the craft is explored in detail with helpful diagrams and gorgeous example photos. An abundance of stitches, bezels, and fringes are explored, providing readers with a wonderful palette of techniques to add to their designs. Dimensional Bead Embroidery closes with a stunning gallery of jewelry by some of bead embroidery’s best designers. My personal favorite is the whimsical Under the Sea bib necklace by Diane Mahan. If you long to try the amazing free style techniques of bead embroidery, or want to add new stitches to your repertoire, this book is a must read! Actions that you take from this post may result in a commission for Inspirational Beading. There are few spring treats as cheerful as a colorfully painted Easter egg. For this month’s bead color picks, I wanted to explore some exciting combinations that bring to mind tasty confections and traditional spring décor. The challenge would be to find just the right balance of organic color, brightness, and fun, with at least one egg-shaped bead per trio. Stunning yellow is a fabulous color for any spring design. It brings to mind the season’s first daisies, baby chicks, and fondant candy. Starting with some opaque dark yellow seed beads, I searched for just the right colors to make a perfect eggy trio. I added sweet and pretty patriot blue rainbow seed beads - the color of robin’s eggs and cloudless skies. To really add a note of outdoor warmth, I finished Egg Hunt with opaque chartreuse green pinch beads. Next I went with a garden inspired palette, starting with some emerald green Swarovski Elements ovals. Soft pearl cream the color of eggshells provides an ideal background for dark green. To add a little more of a spring vibe to this elegant combination, I finished Purple Pysanky with eggplant colored seed beads in cobalt rainbow. The shiny finish of the seed beads pairs really well with the sparkle of the crystals. Preferring the candy colored approach, I started the final palette with lovely turquoise blue Czech glass drops. Adding some lustered orange seed beads brings out just a hint of soft lavender in the drops. For the perfect contrast, I added lovely, light-filled transparent magatamas in lemon-lime AB to complete this Jelly Bean palette. What color combinations do you like to use for spring cheer? At last things are starting to move along on my bead tray. I feel like I’ve been working on this collar for ages, but it should be finished and ready to photograph by tomorrow. I can’t wait to start something new! I made several small adjustments to the pattern that I shared on last week's bead tray. All of the colors and the pattern are the same, but I found that I didn’t like the color proportions. The first thing I did was shrink the yellow by changing the edging of the nets, and I was much happier with how it looked overall. Although I was hoping for a sort of African tribal look with this collar, I’m still really pleased with the more fiesta-like feel it has. I’m also wrapping up a new medallion pendant. I promise I’ll reveal the big secret behind them soon! As soon as I remember to pick up some more knot sealer - aka clear nail polish - I’ll be able to photograph the finished pieces that I have for the big reveal. One of the best ways to create designs that really stand out is to use materials that are unique and exciting. Today my guest is Tina, owner of O and N Craft Supplies - an amazing source of gorgeous beads and beading materials straight from Greece. Tina: I’ve been making jewelry since I was a teenager and even have an Etsy jewelry shop. 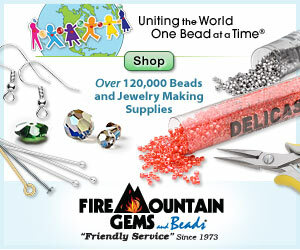 The world of jewelry supplies and craft supplies in general is a fascinating world for me, I can't have enough of them. When my husband and I became unemployed as a result of the economy crisis in Greece, we were trying to decide what could the next step be. We needed something we could both do. My knowledge of jewelry making and quality Greek craft products lead us to open our O and N Etsy shop and only a few days ago our own O and N site. Tina: We can serve our clients on a personal basis. We can help them find what they need and answer their questions more effectively. Moreover a small shop is more likely to build a coherent style, a certain personality where clients go to shop because they want to cover specific needs. It is like shopping in a boutique shop rather than a department store. 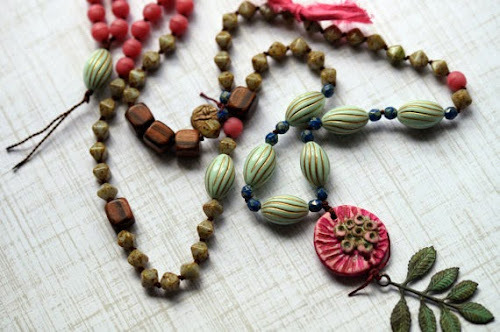 Tina: I love Greek ceramic beads especially the enameled, very shiny ones and our craft cords, braided silk cords and wrapped cotton cords are my favorite. Tina: Our ceramic beads are all made in Greece, as they were for thousands of years, of course adjusting to contemporary aesthetics. They have beautiful, vivid colors. They are often handformed and unglazed which gives them an earthy, handmade quality. Other times they have amazing, lustrous surfaces, more beautiful than pictures can show, as a result of multiple firings in the kiln, which makes them perfect for more luxurious, elegant projects. Another thing not to be neglected is that we can offer Greek ceramic beads in the best prices. Tina: I will be honest, nothing compares with the feeling when someone appreciates something you made! But often I picture our customers the moment when the first open their package, and ideas start popping in their head at the first sight of our jewelry supplies and it makes me smile. 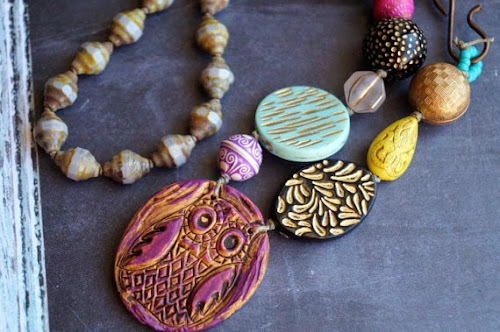 Tina: I like statement necklaces with multiple rows of cords of different textures and chunky ceramic beads. Tina: Our next step is to add Greek leather cord which is the best quality leather cord. You can see more unique and colorful beads and craft supplies at O an N and on Etsy. To see the latest additions and specials, follow along on Facebook.